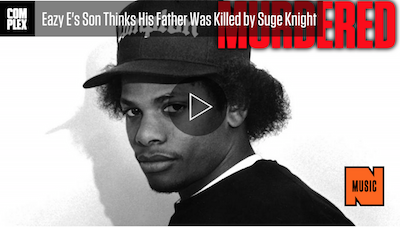 Eazy E’s Son ‘Lil Eazy’ Says Suge Knight Killed His Father By Injecting Him With AIDS Virus. With the incredible success of Straight Outta Compton, the questions surrounding Eazy E’s death from AIDS have come back into the forefront of discussion. Eazy’s own son, Lil Eazy is speaking out about his doubts of his father’s death in a recent Instagram post. He explains he always thought his dad was killed and points fingers to Suge Knight. He goes as far as to say that he believes Suge injected AIDS into the rapper. 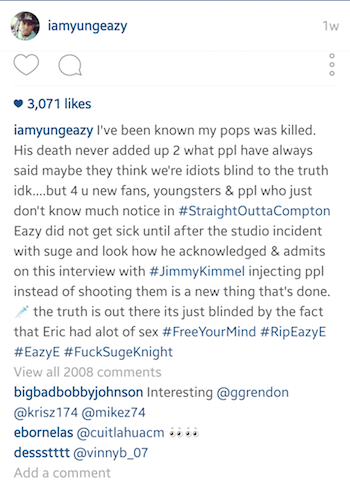 “Eazy did not get sick until after the studio incident with Suge and look how he acknowledged and admits on this interview with #JimmyKimmel injecting ppl instead of shooting them is a new thing that’s done,” he wrote on the post. What do you think about these accusations? You can check out his instead gram post below. Share with your friends and see what they think! Did Suge Knight really kill Eazy E?